Jennie was my grandmother. We lived very close to her when I was a baby, then she moved a four-hour drive away when I was 3 or 4. She lived in a small single-wide trailer on land she had bought - at first, but I remember the day she got her double-wide trailer. It arrived in two parts, with plastic covering the open halves. My father and my Uncle Ron cut open a small window in the plastic and passed me through to check out the rooms. I was the first one to see two bedrooms and a bathroom in one section of my Grandma's new home. I went into the bathroom and remember my dad asking, "What's on the walls?" "It's supposed to be butterflies," my dad responded. Those are my earliest memories of the place I would learn to crochet. 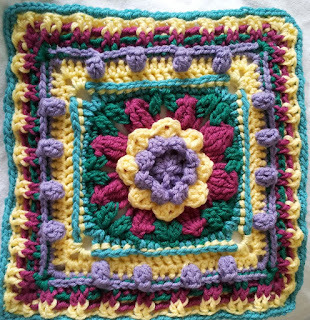 Patience was the first lesson my grandmother taught me when I asked her to teach me crochet. I asked twice before the summer I was ten, and twice she insisted, wait until the summer. I spent many summers with my grandmother. Sometimes for two or three weeks, sometimes for two months. We played a lot of Skip-bo, and Dice (which everyone now calls Farkle, though I think our house rules made the game more challenging). When my dad was there, we'd play Uno. Though we didn't play Uno much when it was just the two of us, I don't think my grandmother liked it much that he would always finish his hands with a wild draw four. I also played a lot outside, used my imagination, and accompanied my grandmother on outings. She lived in a quiet place and I cherished it. My first crochet piece was a pair of slippers. 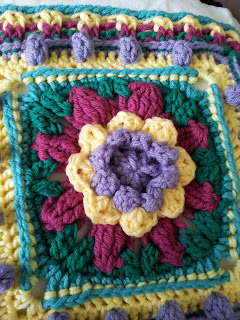 First you crochet a long chain of even numbered stitches, then decrease the middle two stitches each row until you have no more stitches and have made a square. Fold your piece along the diagonal of decreases and slip stitch the two folds together along one side and up the other enough to cover the heel comfortably. Wear your slipper, folding the point that comes up your shin down and around your ankle. My sister and I called these "Elf Slippers," because the toes are pointy and the flap is pointy, and we all know elves wear pointy shoes. 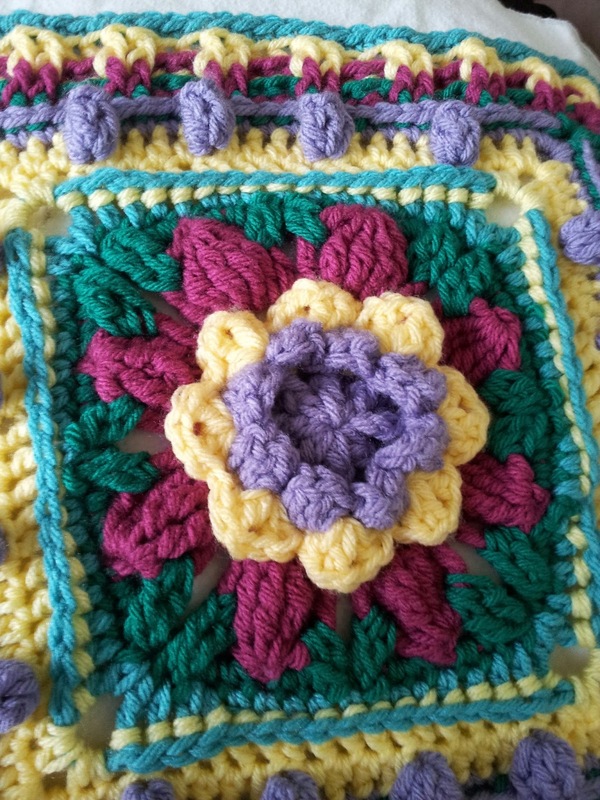 After a few pairs of elf slippers and a summer or two later, I crocheted a granny square afghan from my grandmother's scraps and learned to read patterns. 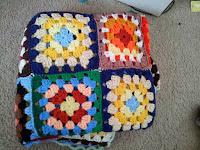 My first afghan, recently retrieved from storage! There're at least four squares that need to be repaired, but that doesn't stop this little one from inspecting it. 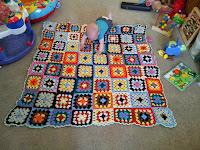 After that, my older sister was expecting and I began making blankets for my nephews. I remember showing my grandmother my first baby blanket. I had started it before I went to visit her for the summer. I thought I was crocheting double crochet stitches, but she told me I was doing half double crochet. She didn't correct me on my stitch placement, though. I was placing all of my stitches in the back loop only. Every blanket I made until about four years ago has back loop only stitching! I think I've been rambling a bit much, so I'll try to get to the point. My grandmother's place was always my favorite place to visit. When I stayed for the summer, it was a quiet getaway. When my family went together, it was quality time we spent on vacation. Sometimes it was just my parents, sometimes my aunt and uncle came too, and I remember a few rare occasions where everyone gathered at my grandma's house (which is how I imagined it was before she moved away). Sometimes, we drove to the beach, and those were my first memories of the ocean. 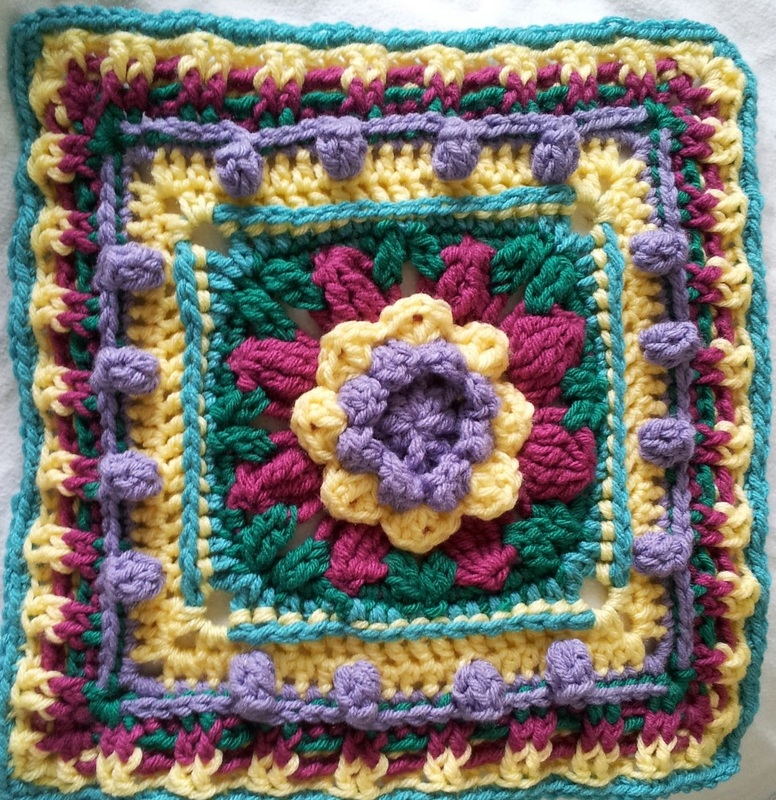 I cherish the thought that my grandmother passed on to me the knowledge of crochet - this wonderful way that I can be creative, expressive, and make something memorable. And that early memory I shared... important to me in a different way, for all three of those wonderful people are gone from my life now - my grandmother passed 8 1/2 years ago, my Uncle Ron just a year later, and my father this past January. Writing is another way for me to be creative, expressive, and make something memorable (and I did a lot of it at my grandmother's too). This post, this square I've created, is in loving memory of my grandmother. Thank you for sharing your beautiful memories and stories. 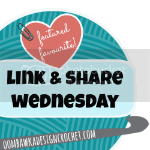 I had a similar journey with my grandmother and that is where I got my passion for crocheting and creating. My grandmother passed away in 1989 and due to strokes lost her memories of how to crochet which broke my heart. But I still have all the other wonderful memories that I will cherish forever. That song is Elvira by the Oak Ridge Boys. Or possibly Kenny Rogers and The First Addition. They both sang the song. I love that song!! !